Our pre-school caters for 32-40 children aged from 3-5 years with a minimum 1:8 adult to child ratio. 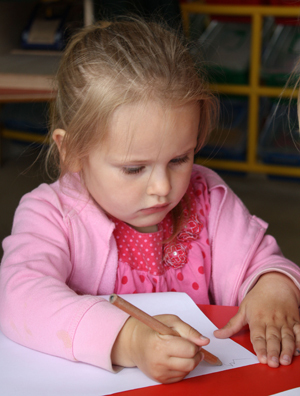 The pre-school also welcomes 4-8 older two-year-olds on a 1:4 adult to child ratio. These two year olds begin to experience the routine and structure of the pre-school prior to them joining the group, which ensures a smooth transition. The pre-school is split into two areas, the Butterflies and the Caterpillars. The Butterflies are the older children who are preparing to go to big school, and the Caterpillars are the younger pre-school children. In the Pre-School area we aim to provide a home from home environment whilst preparing each child for the transition to school by promoting independence. We provide a wide variety of learning experiences and activities both indoors and outdoors, including a weekly PE lesson for the Butterfly group. We work with parents by sending out the monthly planning by email so that they know what we are focusing on here at the nursery. The parents find this really useful as they can then focus on these areas at home with their children too.